Synodontis euptera common name Feather Fin synodontis. These are a large growing cat fish, they can get up to 30 cm /12 inches fully grown. They live in PH range 6.5-7.5, and temperatures of 22-27 Celsius / 72-81 °F. 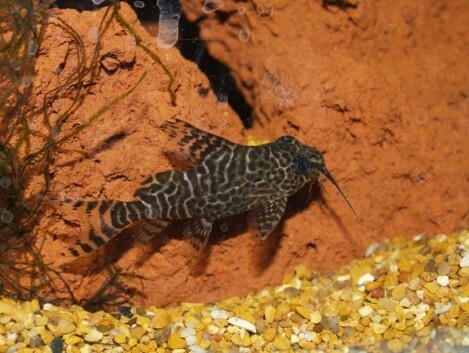 Feather fin synodontis are a lovely bottom feeding fish. When they are small they are lovely and peaceful and can mix with small to medium size fish. However because of how big they grow, really they are best kept with bigger fish, as they can easily eat smaller fish that can fit in there mouths. They have spikes on there fins, these can cause harm to other fish, cause them to get stuck in fish nets, pierce through fish bags, but can also puncture skin. Never touch or pick these fish up, as it can be a nasty sting like feeling. But these spikes protect them well against bigger and aggressive fish. They are a bottom feeding fish so enjoy a diet of sinking foods. Flake, cat fish pellets, and a sinking granular food is always good for them, they will also enjoy freeze dried, frozen or live foods. Flake, cat fish pellets, and sinking granular foods. Also frozen and live foods are good for them.